There's nothing quite like having a three day week. You know the feeling: the moment you set the out of office message, switch off the laptop and let the door swing shut behind you. Wednesday. 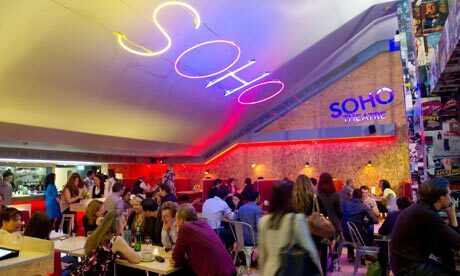 I headed over to the Soho Theatre Bar for a drink. I've walked past the theatre every single morning on the way to and from work but shamefully haven't stepped inside. Home to a whole mix of live performance, the theatre prides itself on being a place for new writers to showcase their work, and comedians to run work-in-progress nights all for the average price of £10 a ticket. (I've just seen they're putting on a run of Bluebeard, a gothic fairytale I studied at university, so might just have to snap up a seat). Their bar serves not only as a pre- and post-performance hang out but is open come one come all. We grabbed a booth and a bottle of wine and caught up as the audience came and went. It's a great little place; casual and non-assuming and next door to Dean Street stalwart Quo Vadis if you're in the mood for something a little more decadent. From there, we upped the ante a little and headed over to The Sanderson Hotel in NoHo. The site of an infamous wager and a practical joke, the hotel describes itself as a 'surreal Cocteau-like dream world' complete with a red lip sofa, and the never-ending onyx 'Long Bar'. At more than 80 feet long, it's an imposing and glittering addition, offering tempting glances out into the ornamental courtyard. It's all very dramatic - especially if you find the Purple Bar, draped in dark violet silk and decadent black - but that's part of the fun. We ordered a couple of cocktails including the lychee martini, the Sanderson martini, as well as a couple of other fruity concoctions which were predictably tasty. Hotels aren't my typical vibe, there's something about the transience that means the atmosphere can be a bit lacking. It's a great spot to people watch, although two drinks each is enough time. Go for the outside courtyard, the Purple Bar in all its wackiness and the mirrorception in the ladies on the first floor and fall down the rabbit hole into the dreamworld.